How do you carry yourself at the firehouse? 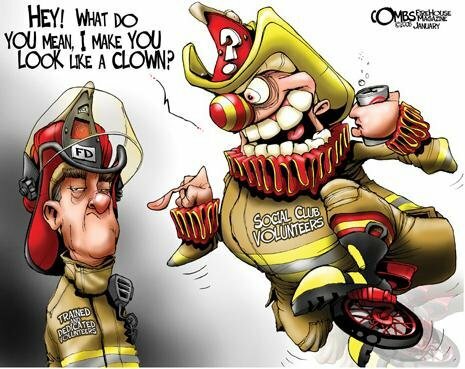 Drawn by Fire artist Paul Combs’ cartoon (below) expresses ideas and concerns of many firefighters today. There seems to be a constant struggle between those who are dedicated to the service and those who are dedicated to the t-shirts they wear. There are members that are volunteers because they enjoy learning and have a passion for helping others. These men and women create the department’s image as being a reputable agency to their jurisdictions residents and colleges among mutual aid departments. However a few bad members can ruin all of that hard work. There will always be sour apples in every organization you are apart of, its part of life. But how you hold yourself and how you react is what will set you and your department from the rest of those dealing with these situations. Integrity, honesty, and credibility are some of the most important characteristics in a department and as an individual. Don’t let these kinds of members infect the minds of new upcoming members. Work together to create a strong mindset and use your department’s policies to maintain credibility. Discipline those who need to be disciplined and assist those members in understanding what is taboo and what is acceptable. The firehouse culture is a unique dynamic that is built on many variables that can influence how the department as an entity is perceived. If the department has a standing tradition for working hard and playing hard using a set standard; keep it going but remember there is always room for improvement. Sometimes taking one for the team means dealing with one person to benefit the fluid operation of the department as a whole. Next F&V Gear Now Available!